I am feeling kinda blah today. After seeing the doctor today (it’s only a back sprain; use heat, light stretching and Aleve), I wasn’t in the mood to socialize with people. Anyway, I was totally out of the party mood. An awesome lunch with co-worker Camille was postponed until next week. (Sorry, Camille.) Also, the pizza place is still closed. The Van Dam Diner was quieter as usual. No matter…I sat in back booth, alone with my thoughts. Luckily, I picked a winner of a lunch: a marinated portobello mushroom burger (sans cheese) deluxe, which included a sour dill pickle (way too sour, folks! 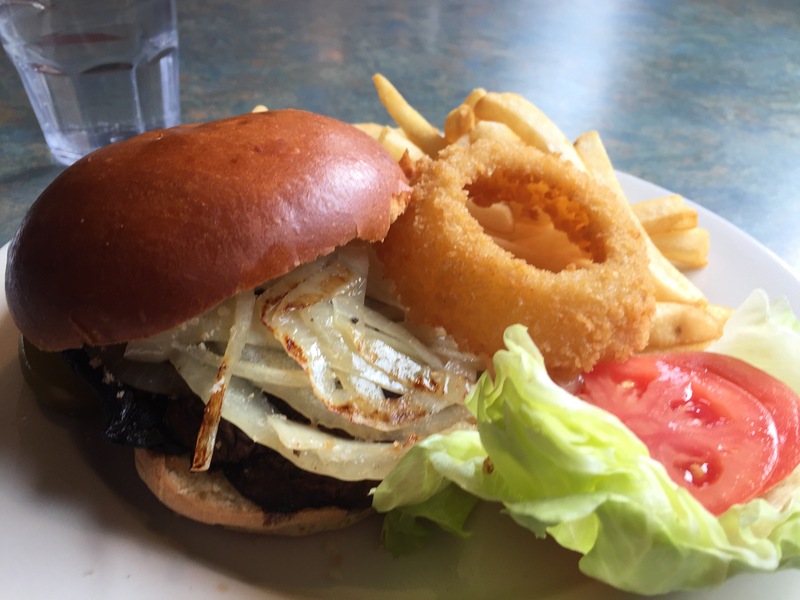 ), French fries, sautéed onions, tomato & lettuce, and a bonus onion ring! Okay, now I do feel a bit better, thanks to these fun vegetables :). Thanks, Van Dam Diner!